Signs on our digital branch: if you visited our website in the past month, you knew about our ILS migration! 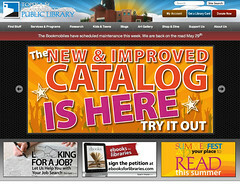 We used one of our big ads on the main page of our website to point to an article and video about the change. People actually read the article (judging by our Google Analytics numbers) and we received 38 comments on the article (some from me, answering questions). We actually used that article and the big front-page ad as a countdown of sorts, too. Every day, we updated the ad (i.e., 3,2,1, it’s here! type stuff) and updated the article with a “tip of the day” for the new catalog. Social Media: We shared about the project widely via social media. For us, that meant pointing to the article and answering questions about the project using Twitter and Facebook. We also made a video about the project, and dumped it into Youtube and on our website. 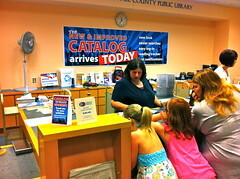 Traditional Media: we have a good relationship with local media, so we were able to tell customers about the new library catalog via a local TV station (they do a “Library Tuesdays” segment during their 4pm news show) and through an article in our local newspaper. And now, the big question – did all that communication work? I think so. While I’m sure there are people showing up at the library or at our website, thinking “what the heck? Why does this look different all of the sudden?” I also know that customers knew about our project. Why? Because they told us. I had more than one person come up to me, find out I worked at the library, and said “how’s that new library catalog project coming along? We love the library!” Other staff told me they had a similar experience. That says to me that our customers, for the most part, got the message. So – mischief managed! Have you ever had to communicate with a large group of customers about a project? Did you do something I didn’t list? Let me know in the comments! The Daily Grape and the Daily Book? Gary Vaynerchuk, who made videos about wine at Wine Library TV and now at the Daily Grape, has a really cool idea about how to add value to his wine videos, and to help his viewers keep track of (and buy) wine they’re interesting in trying. Gary noticed that he mentions a lot of wine, and some of his viewers forget about the wine after they’re done watching the video. So why not make an app to solve that problem? sign up for a free account through the Daily Grape app. If you like the sound of a wine Gary mentions, you can click through to the video details, and add the wine to your wish list. Then you have a handy list when you’re at a restaurant or a wine store. You can also comment on the wines found on the app. Cool idea, huh? Believe it or not, I think this could work for libraries, too. More wine for everybody! No, just kidding. We have books, don’t we? My library has a collection of almost 500,000 books/videos/etc. Do you think our patrons can remember all those titles? Right – probably not. But that’s why some of the newer ILS’s include things like wish lists, tags, and comments. I’ve seen some library catalogs that let you take those wish lists and turn them into RSS feeds, which gives your patrons the ability to embed their lists wherever they want. That’s cool. But what if library staff did the same thing? Why not keep a running list of staff picks that can be discovered in the catalog and on the website. And on the library’s blog sidebar (since it’s embeddable). And in Facebook (with a little coding added in). In fact, my library is already providing some of that, in the form of blog posts with links to good books that happen to be in our collection. So – just a slightly different, slightly more purposeful way to think about content created by library staff. Be a bit purposeful, like Gary Vaynerchuk – direct your customer to good content, help them check stuff out – and provide them with ways to remember the books they want to read. Do you do that? If so – how do you do it? Check out Marshall’s Library Technology Guides (www.librarytechnology.org) – great info on who is using what ILS systems, what libraries switched ILS systems, etc. Horizon is next to last on the list of “how satisfied is your library with your current ILS system?” – Great – that’s what we have! Marshall does say take those stats with a grain of salt – people on both ends of the spectrum respond, people int he middle don.t That said, he’s gotten over 2000 responses to his survey. – small libraries generally receive higher perception scores. Discovery Platforms are mattering a lot more right now – that’s what our patrons see, so libraries want to spruce those up. they don’t want help in the beginning anymore. Tech in transition – web-based, cloud-based is the new thing. Client/server is the old thing. Local computing is shifting to cloud platforms. Interestingly, open source systems generally run behind proprietary systems in terms of customer-facing APIsâ€¦ which makes sense. Smaller libraries are using the open source system, larger libraries with complex problems are using the proprietary systems.